Good morning. I apologize for being absent lately. I think that I am finally recovering from September. I don't know about any of you but it was crazy. School starting coupled with a busy month in my Etsy shop made for an insane month. Don't get me wrong, I am grateful. The kids are happy to be back in school. And I am thrilled to have been busy in my store. Our home is very neutral in hue. There is a lot of white and oatmeal or sand color. I strive to make it calm and soothing. But sometimes it needs a bit of color to liven it up. I like the color pink. But what I really love is the palest shade of pink with a hint of blue in it. I was very excited when I found this grain sack material with pink stripes through it. You don't see this color in hand loomed hemp linen too often. 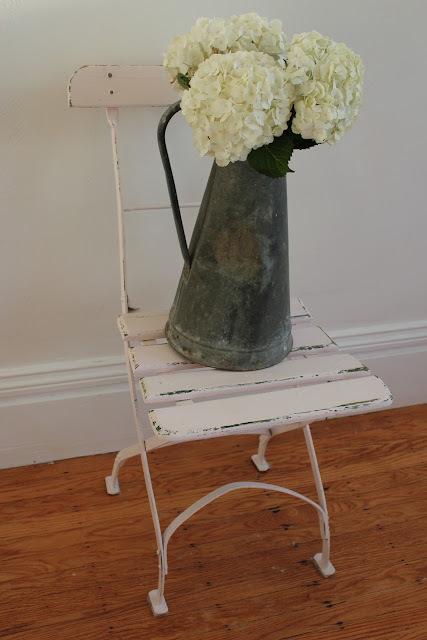 I even painted a bistro chair pink once and placed it the girls' room. This material with pink and blue stripes though it was made into a very large tote bag. And I pink up some pink buds at the market whenever I can. That delicate shade of pink works perfectly in your home. I really love your cute picture with the quote too. That will be a helpful reminder for sure! Glad you're back in the world of blogging again. I love pink flowers too. Even though it has been overused, I think the original Keep calm is still my favorite. I love the very pale pink you used on that chair. So gorgeous Michele!! I've missed your posts, but I completely understand about being busy! It has been crazy around here too. Glad youre back!!! Love all the pink and such wonderful news that your shop is sooo busy!! 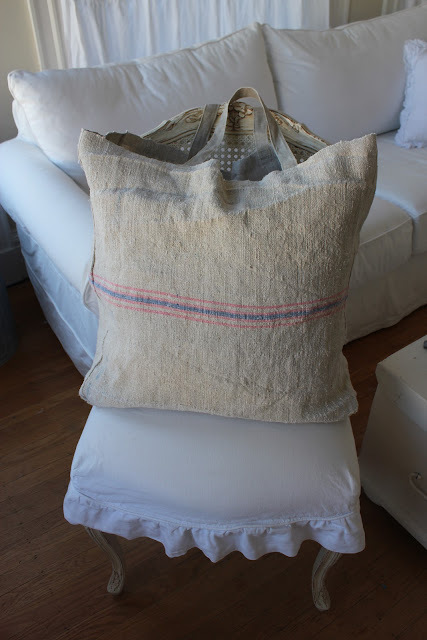 I love this soft, fresh pink--it's a perfect look with white and vintage linen.